The symposium “Edible Insects: The Value Chain” was held on 21 and 22 March 2018 in Ede, The Netherlands and organized by Wageningen University in collaboration with NGN and Venik. The symposium was dedicated to 10 years of insects research in the Netherlands. During the symposium, several themes were discussed such as: insect breeding, processing of insects, but also the use of insects in Food and Feed. The opinion of the consumer was very important for this symposium, both in European territory and beyond. Partner in the Bioboost project Inagro was present at this symposium. Inagro presented the research possibilities of the practical centre for insect breeding and the objectives of projects including Bioboost. Inagro illustrated his with concrete research results about the influence of the substrate and the density of black soldier fly larvae on the feed conversion ratio. 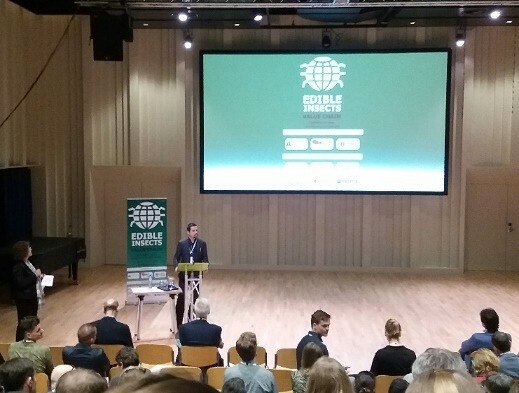 At the symposium were a total of 170 people present who are interested in insects breeding from all over the world, including from South Africa, Russia and Latvia. This created a wide variety of presentations with very fascinating discussions.